Importer & Supplier of Silane Siloxane Water Repellent Coatings & Silane Siloxane Water Repellent Coatings. 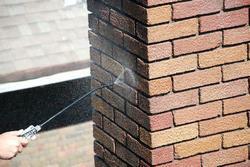 Our product range also comprises of Water Repellent Material and Masonry Water Repellent. We are enlisted amongst the reckoned names in the industry, offering an extensive range of Silane Siloxane Water Repellent Coatings that is valued for its exceptional quality and durability. Our entire product range is specially formulated to easily penetrate to the deep surface of the layer and reduces the absorption of water borne salts and water to the great extend. The recommended coating of the entire product range should be 1parts of ELASTOSIL- ME either 10 to 15 parts of Potable water. Looking for Silane Siloxane Water Repellent Coatings ?